Plus, this week is Biff’s 7th birthday! To celebrate, all Biff books are crazy on sale for only 7 bucks each! Go check them out in the store! Always be familiar with your carrier’s online coverage map. Especially the interplanetary ones. 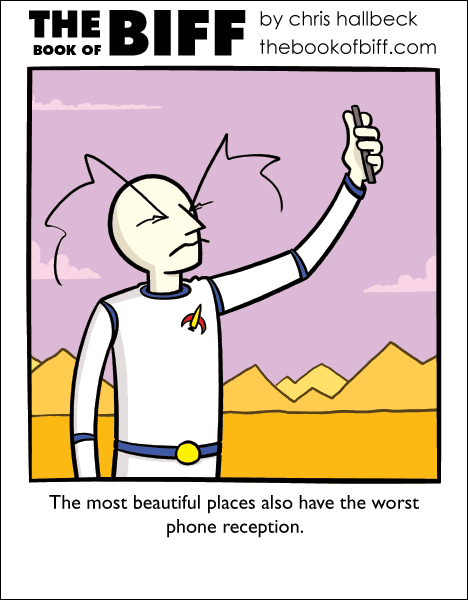 No reception is one of the things that makes such places so beautiful. At first I was thinking “Hey, is Biff exploring that planet again?”. But no, that can’t be the same planet, because this one’s got a purple sky and yellow ground. The other planet had a yellow sky and purple ground! If there aren’t any trees that will eat your phone (and your arm), then there will be no phone reception! How typical! I refuse to move anywhere where I get poor bandwidth or bad reception. I’ll take no bars in the house, but I better get some by the time I hit the main road. My previous comment on this one disappeared…? Anyway, if it isn’t trees that’ll bite your arm off when you try to take a picture of them with your phone (maybe like the one in the link), then there will be no phone reception on the planet! Just so you know, your art is now being used and analysed in a Senior art student’s assignment because I was caught procrastinating it on Biff. My cell carrier makes up for its spotty coverage by selling a gizmo you can hook up to your internet router that puts a little tiny cell inside your house. This way instead of them having to pay to build expensive towers to improve their coverage, they can make their customers pay to put a (slightly less) expensive little cell tower in their living room. And then they try to sell you an additional srvice on top of your regular plan to “get the most” out of your new personal cell tower that you had to buy.